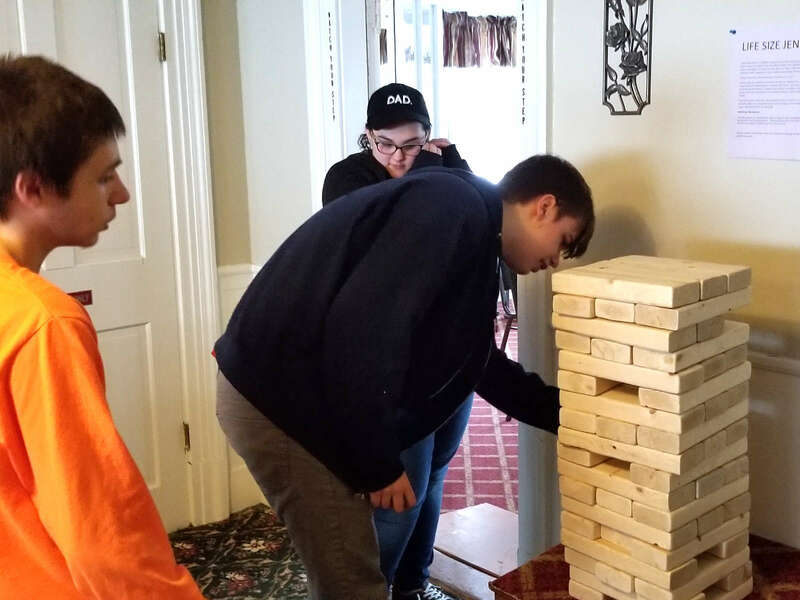 Danny and his friends play the giant Jenga game in the lobby of the Windrifter. Whoever knocks down the tower loses (and it's really noisy when it happens). 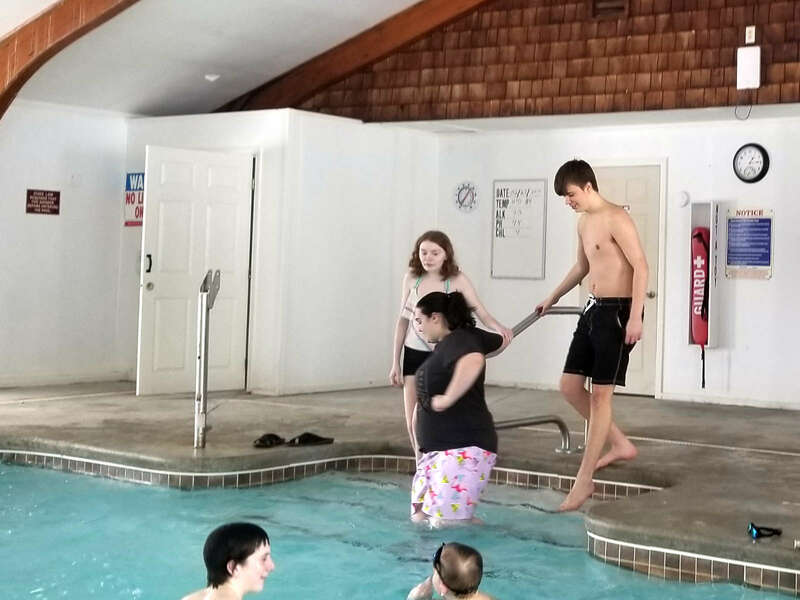 Danny gets into the pool at the Windrifter with some friends. 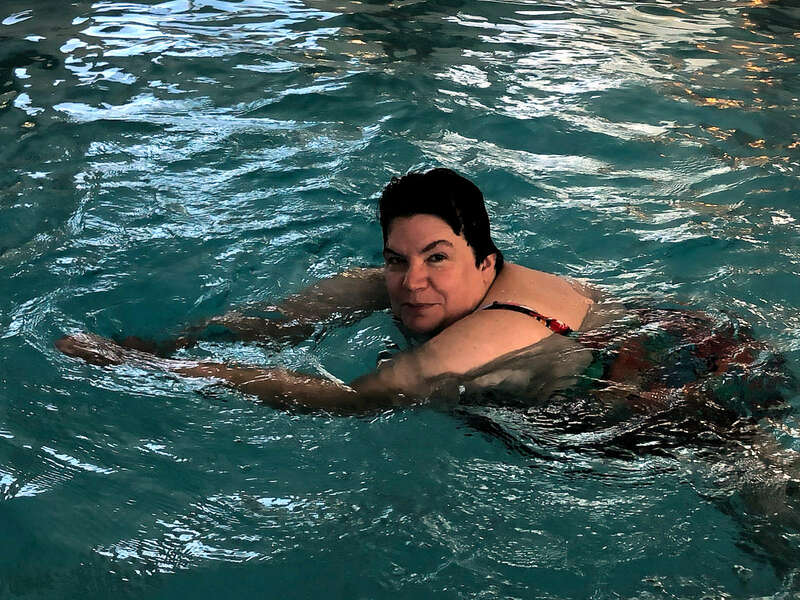 It was in the teens outside, so the warm poolhouse and the water felt very good. 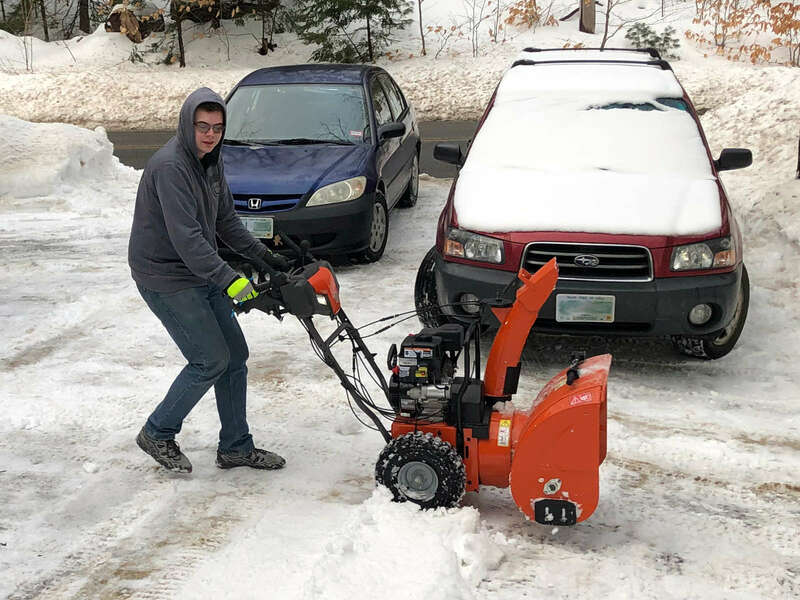 Danny takes a turn with the snowblower. He's had very little experience with this, but he did a great job! 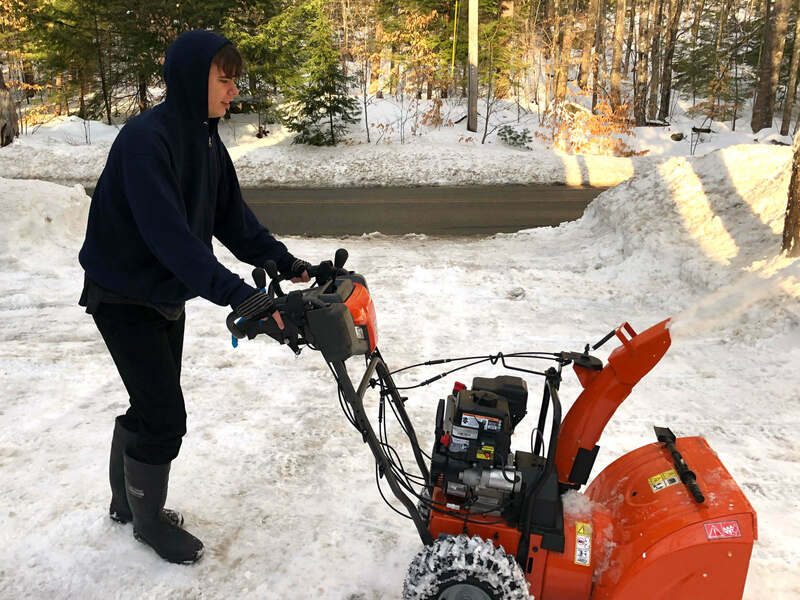 William takes on the new snowblower to clear the most recent storm. Not a big one, but with more on the way we need to keep up. 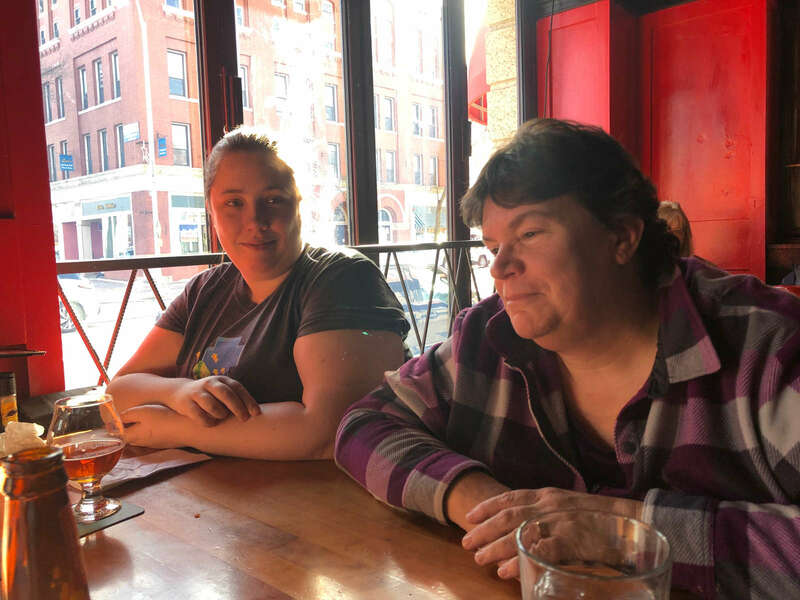 Erin and Karen share a smile while waiting for lunch at the Thirsty Moose. 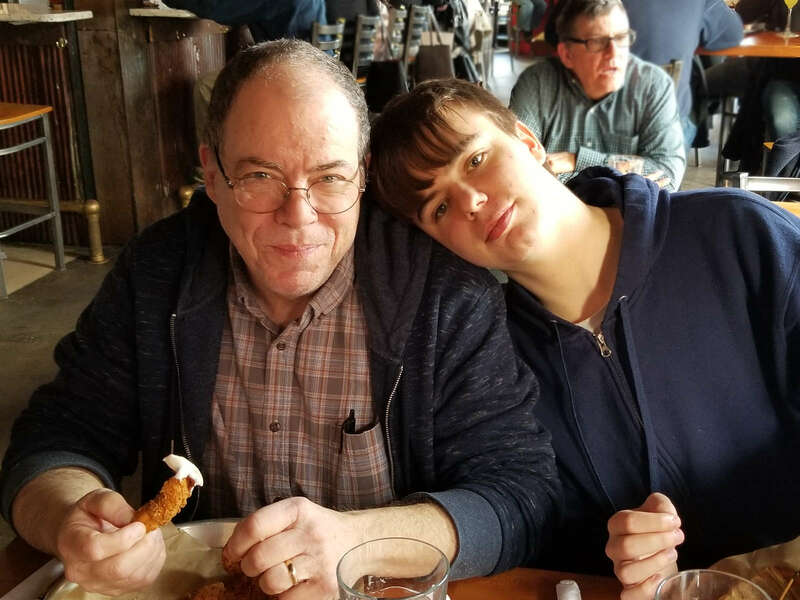 Gordon and Daniel enjoy lunch at the Thirsty Moose. 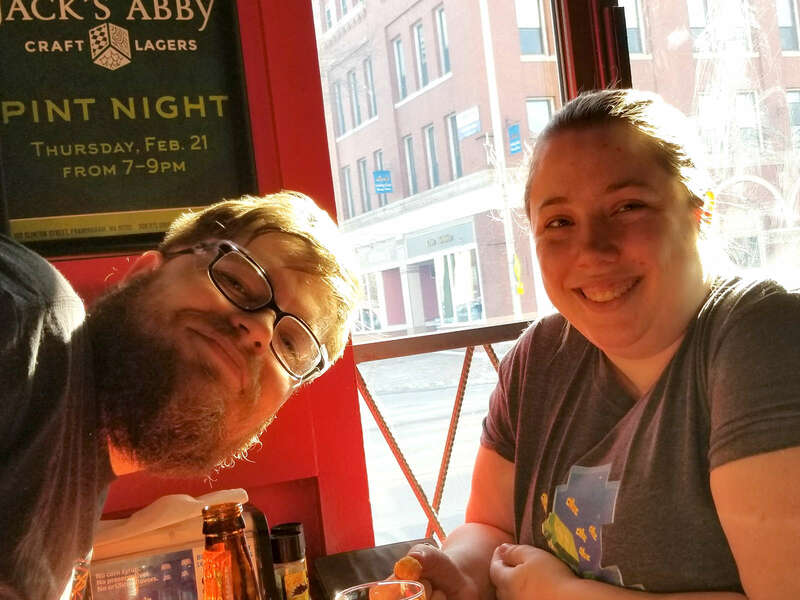 Thomas and Erin at the Thirsty Moose, a taproom with great food where we met before bowling. Out the window you can see the beautiful downtown area of Dover, with a lot of great old buildings. The Moose was originally a bank. 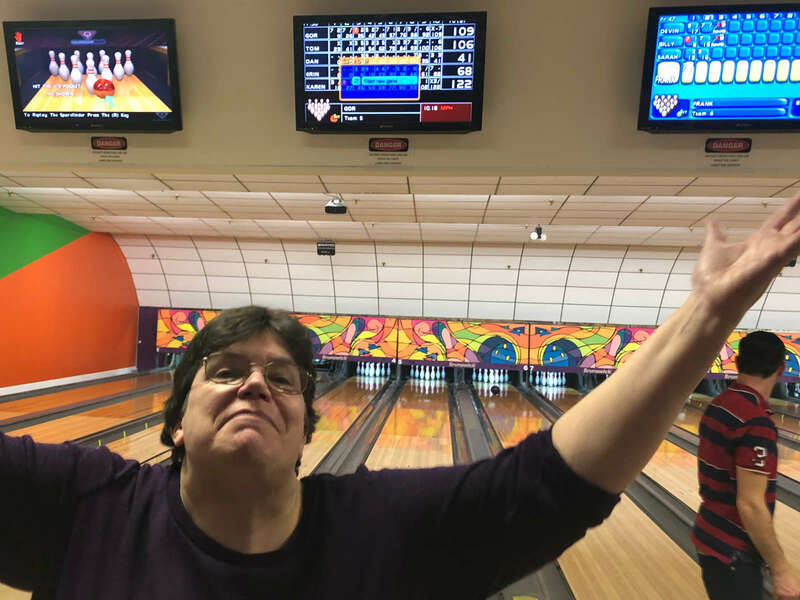 Karen, triumphant after finishing out her bowling game with a strike, thus (as you can see if you look carefully at the score) beating us all. A winner all around! This last storm was very weird; although it was very cold, the snow was sticky. 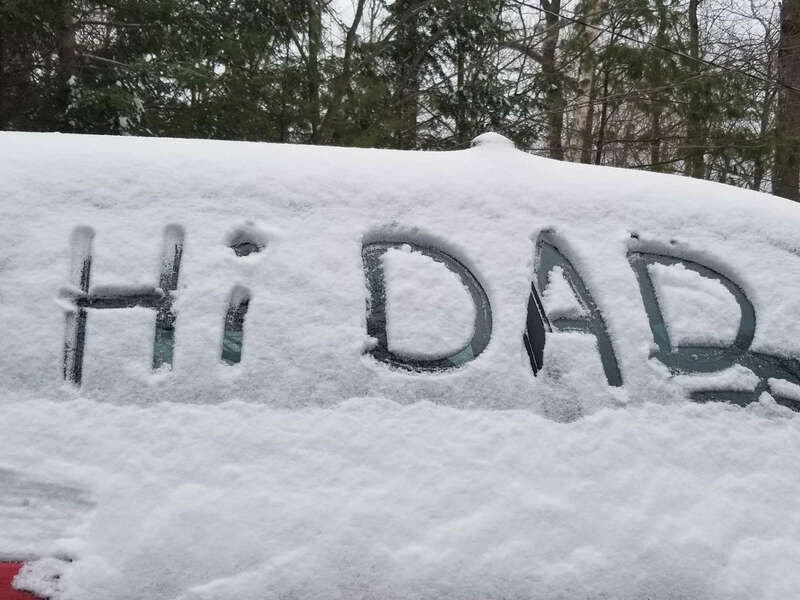 William inscribed this little greeting on the side of his car. 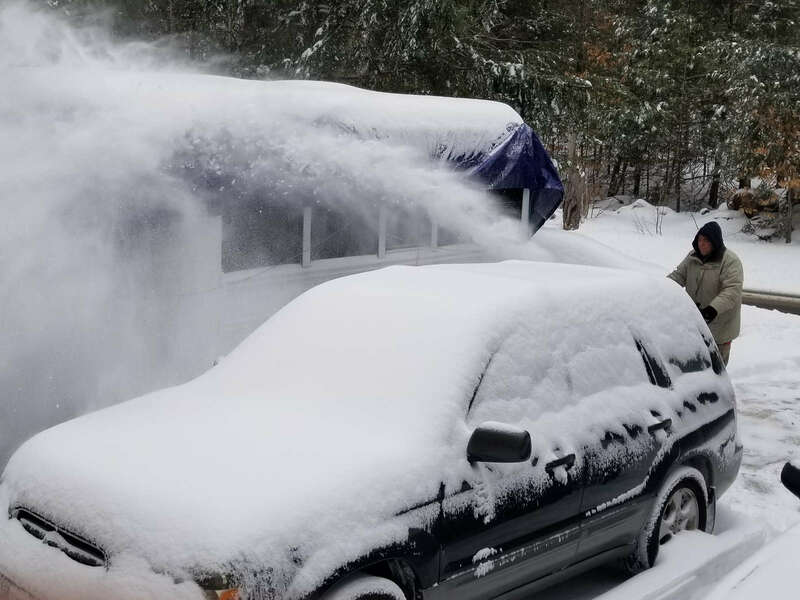 Gordon using our new snow-blower to clear the latest winter storm. Much, much better than the old one! 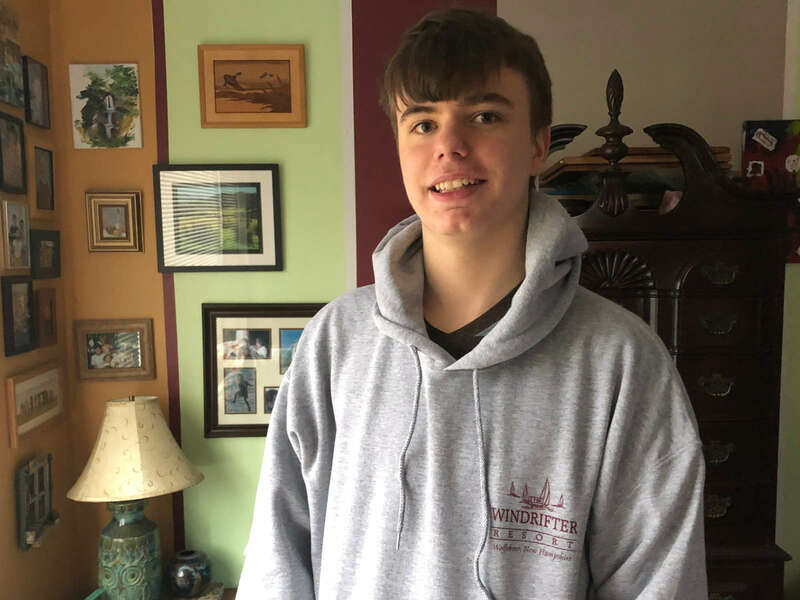 Danny attended a career fair at the high school and entered a raffle, and won this hoodie which just happens to be from The Windfriter Resort, which is where Gordon works. Weird. 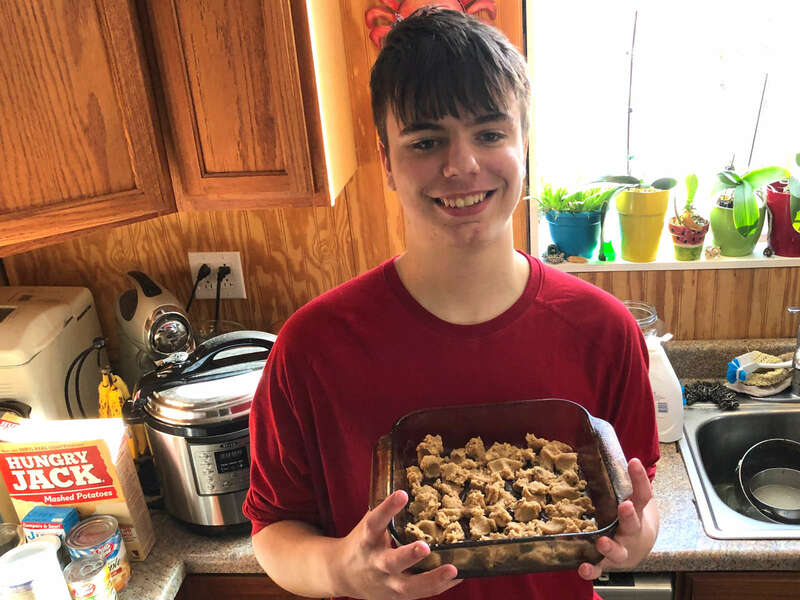 Danny gets a cookie brownie mix ready to go into the oven for our dessert. 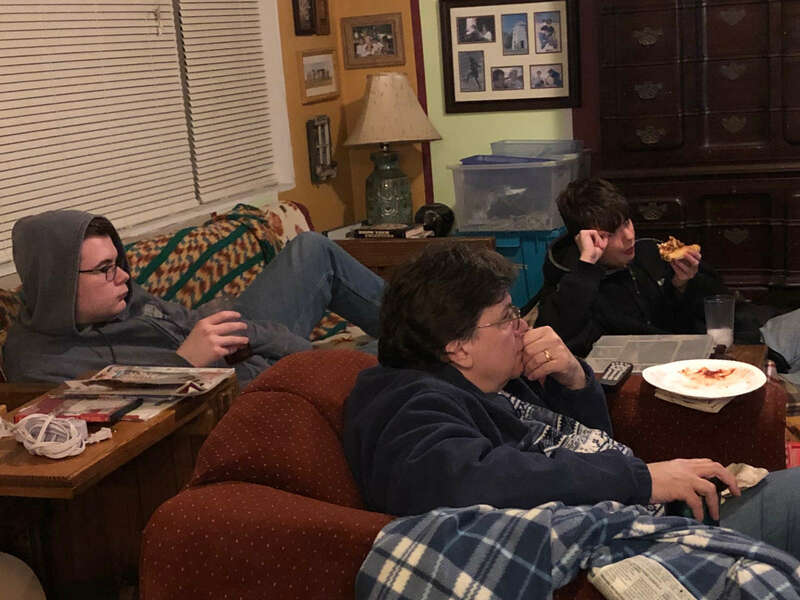 Pizza comes home and "Flash" goes on the TV for William, Karen, and Daniel to watch. 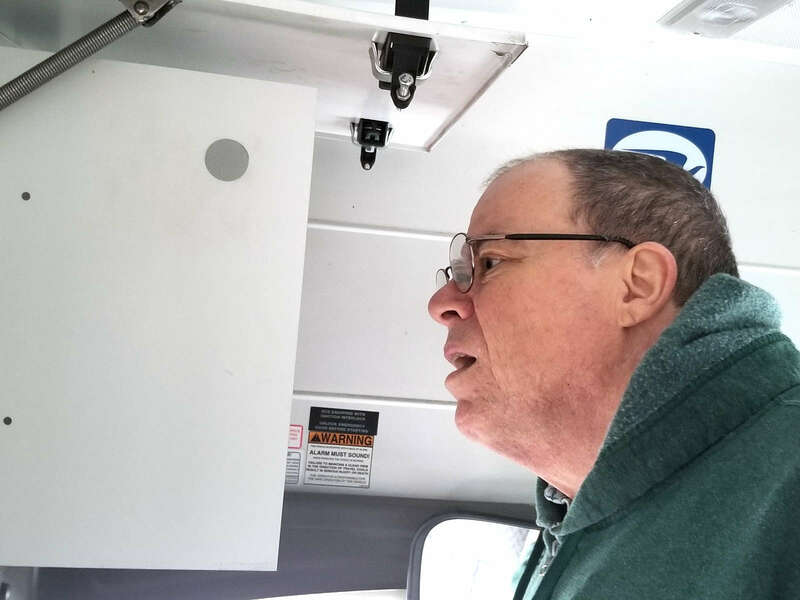 Gordon contemplates a wiring harness hidden behind a storage compartment over the driver's head on the bus; it contains the connections for the various lights on the back of the bus. Danny grinds off the heads of some of the bolts holding down the seats in our bus Gypsy. 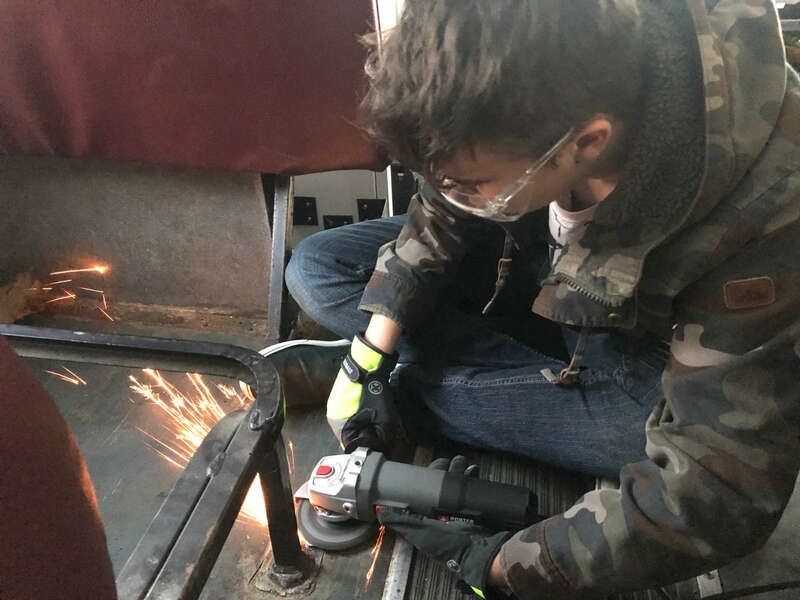 For each seat, we have to unscrew three bolts at the wall, and then grind away four bolts in the middle of the floor until they can be broken off. William, freshly coiffed, and in a rare moment with his hood down. 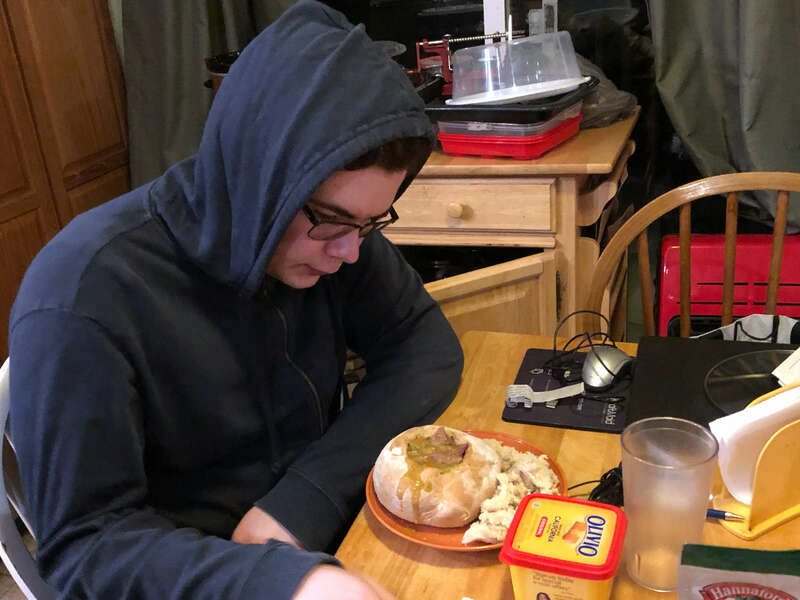 William prepares to dig in to a bread bowl filled with Karen's pea soup. 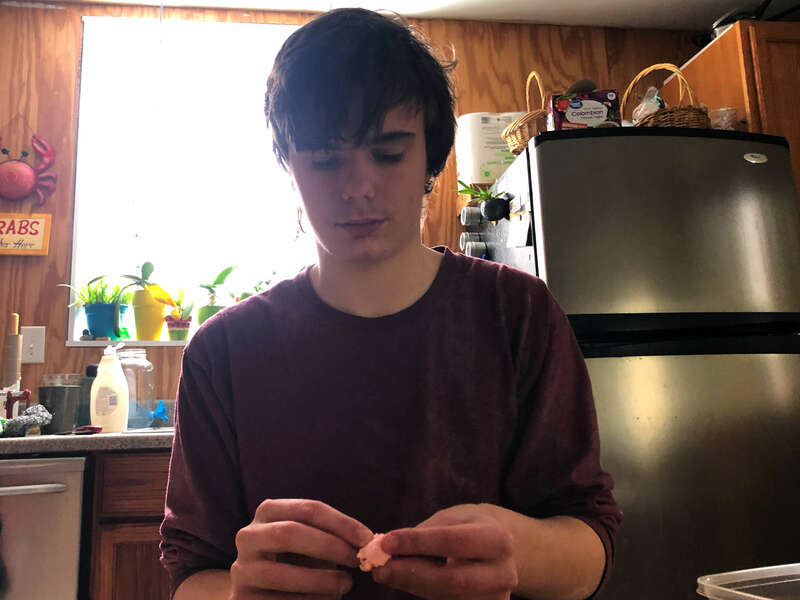 Daniel creates a tart from ingredients made for other treats. The crust is leftover thumbprint cookie dough, and the jam was originally created as a filling for aebleskivers, Danish pancake balls. What is Karen to do on a day when the temperature drops below zero? Why take a swim, of course. In an indoor swimming pool. 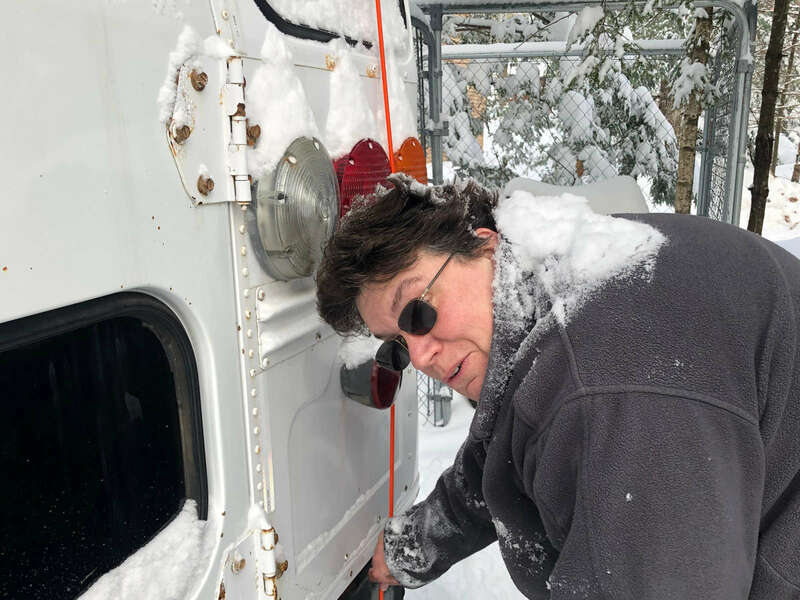 Karen went to adjust a bungee on Gypsy's tarp, and Gypsy decided to give her the gift of snow. 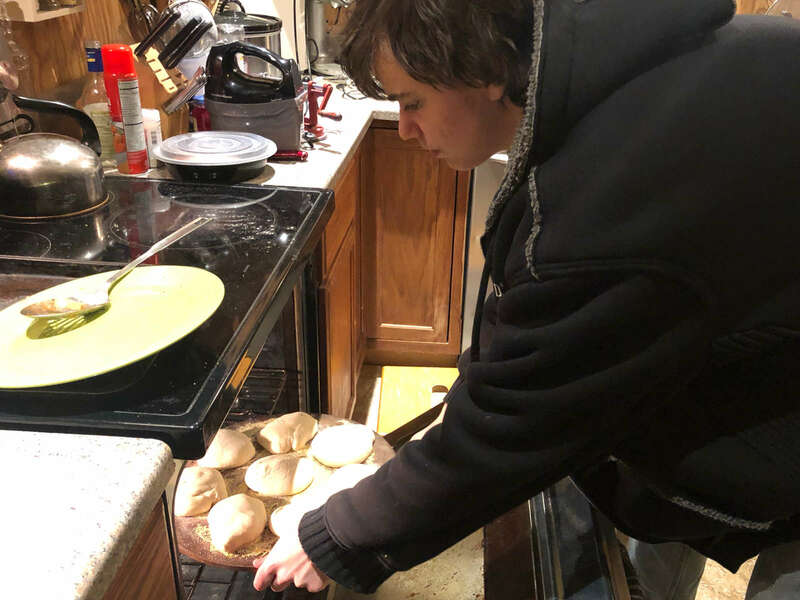 Danny puts some rolls that he helped Gordon make into the oven to bake. 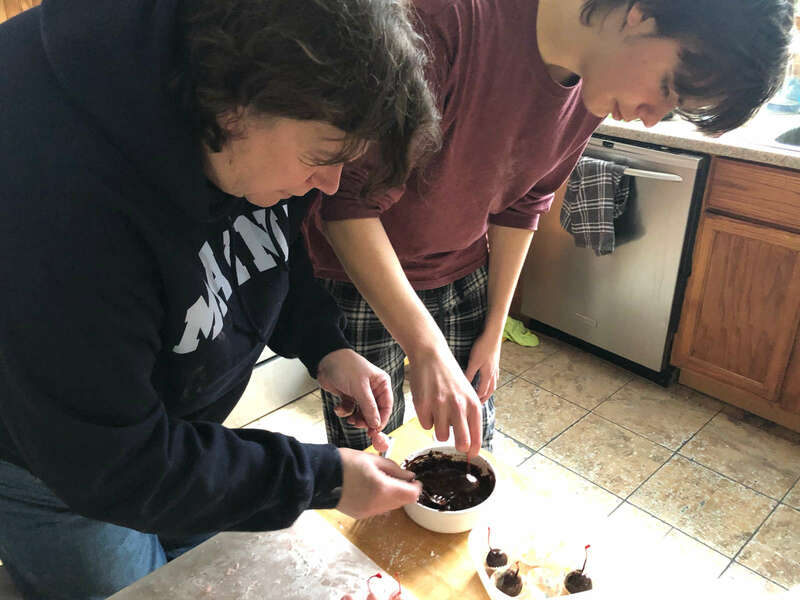 Karen and Danny team up to dip fondant-covered cherries for cherry cordials. Karen wraps fondant around cherries to make cherry cordials. Monday was a holiday, and we were supposed to take a trip, but the day ended up being filled with snow shoveling and (as a break from the snow) cooking. 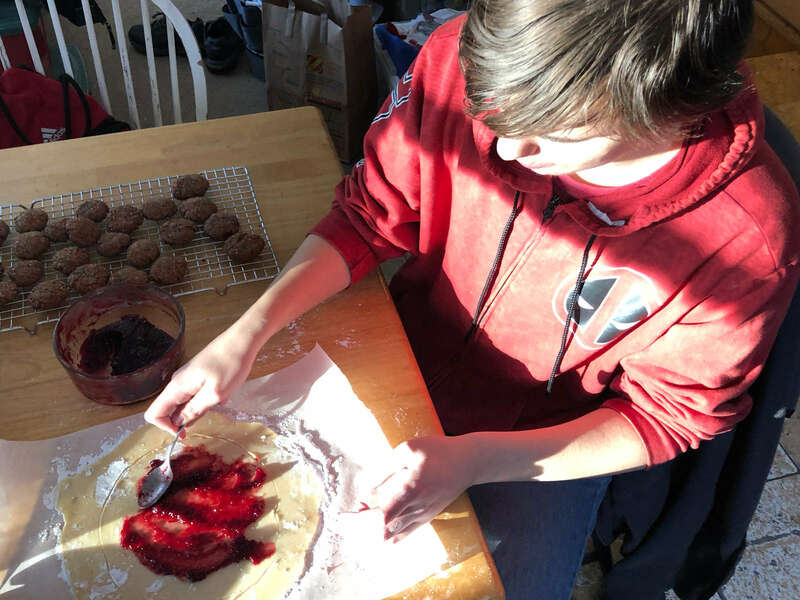 Danny wraps cherry-flavored fondant around maraschino cherries to turn them into cherry cordials. 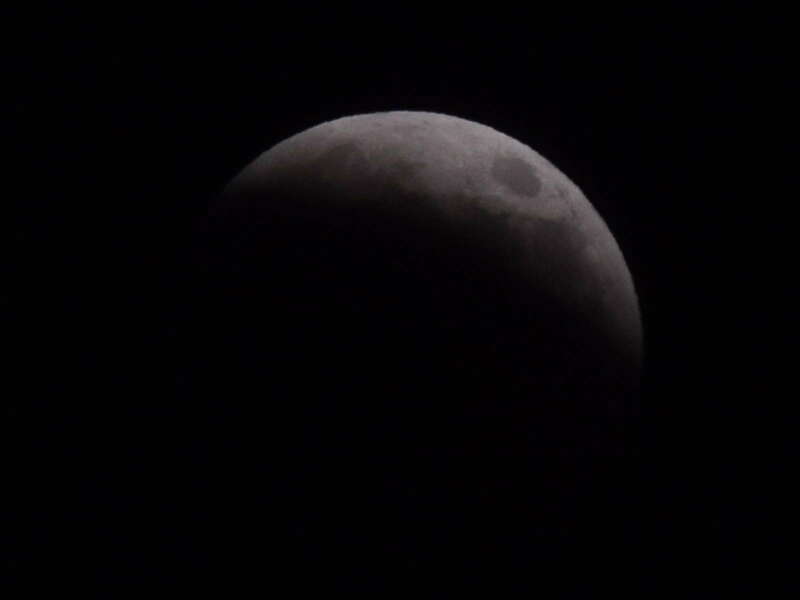 Gordon, Karen, and Danny went out in sub-zero weather on Sunday night to catch a glipmse of the lunar eclipse.. 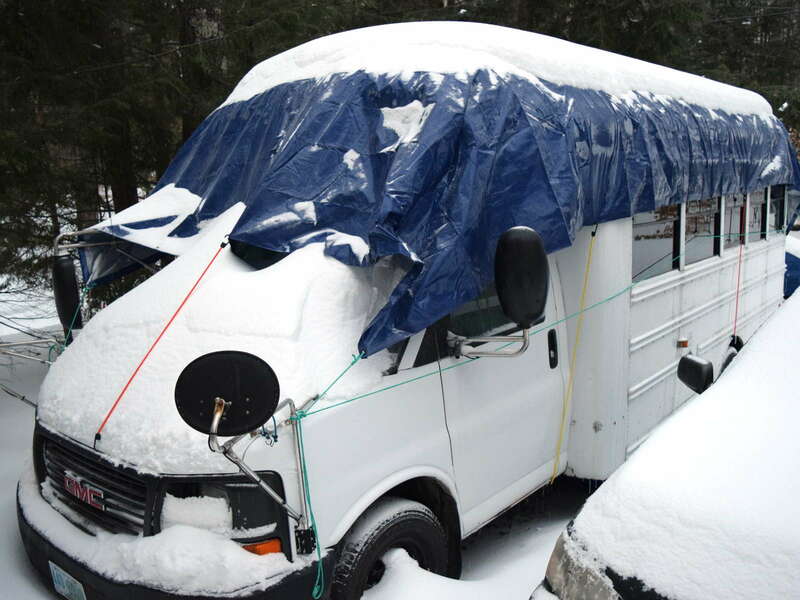 This is why we put a tarp over the bus. Six or so inches of snow and ice over the course of two days left everything something of a mess. 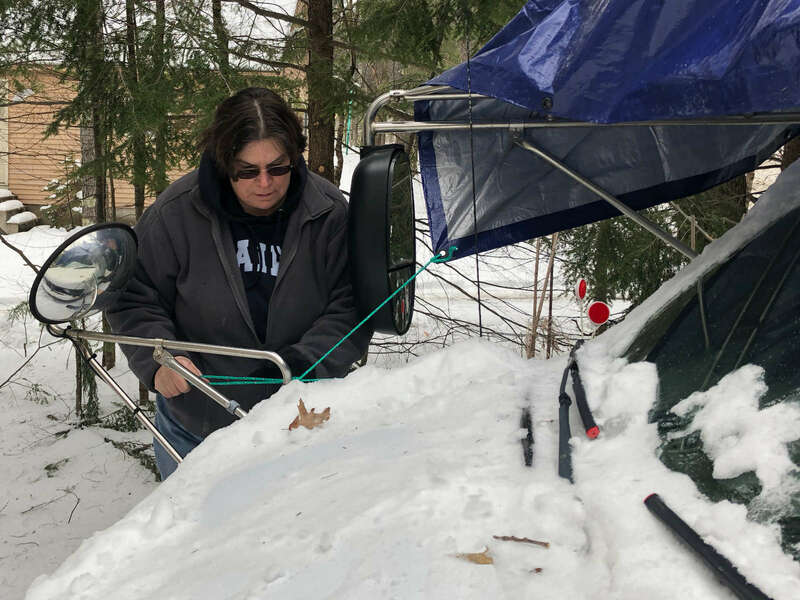 Karen ties a tarp to the bus to help protect it from a big snowstorm heading our way. 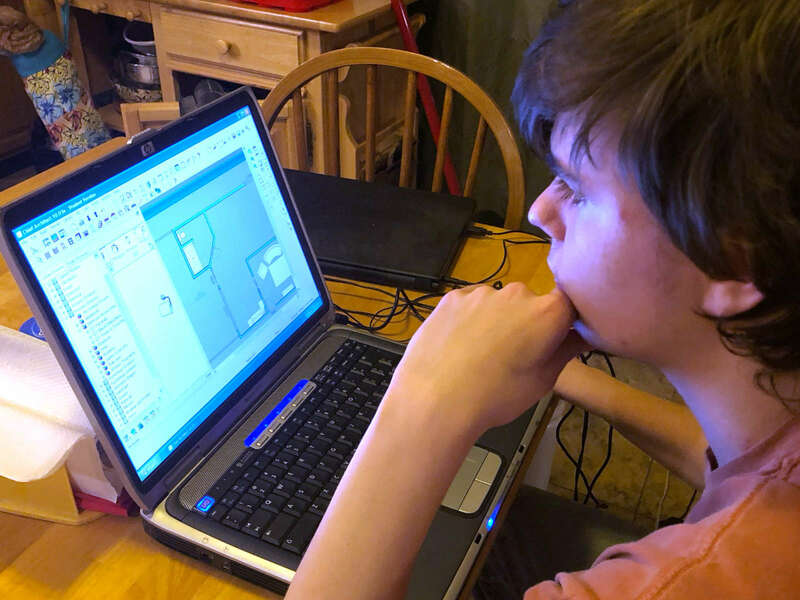 Danny does a small house design using Chief Architect, the program Karen trained on in school, and the one we used to design our current home. 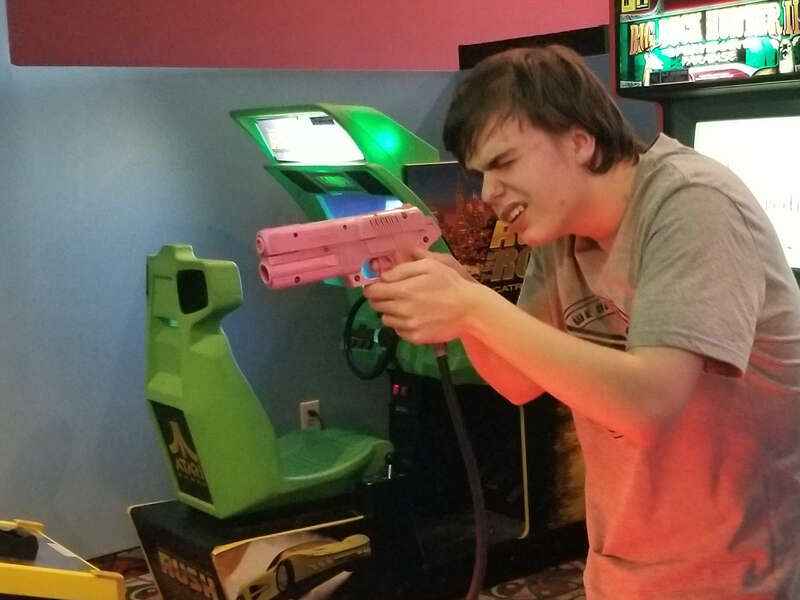 Danny takes aim while playing a video game at the movie theater. 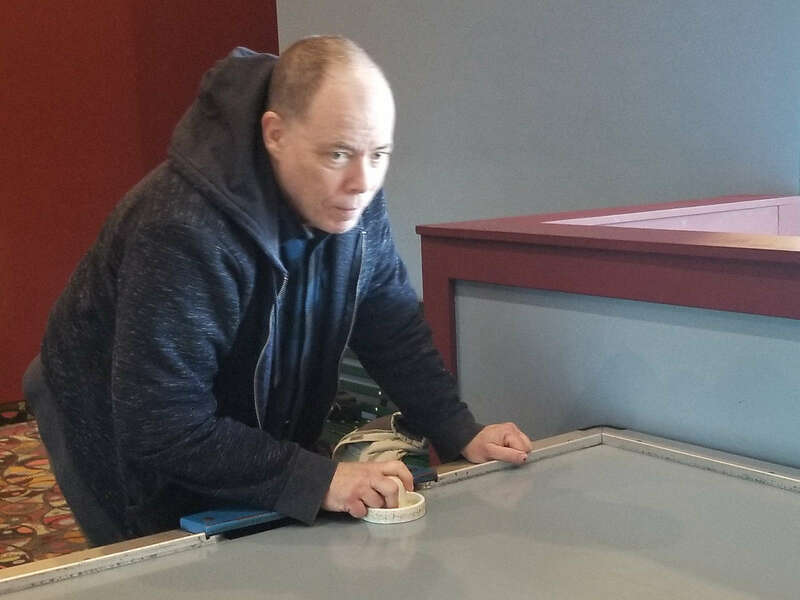 Gordon playing air hockey against William. He got trounced. 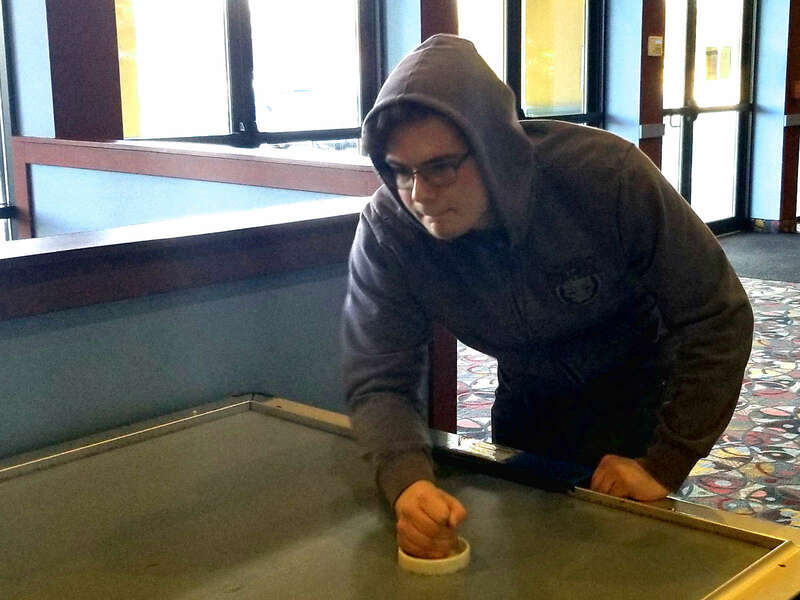 William plays air hockey with Gordon in the lobby at the local movie theater after seeing "The Upside." 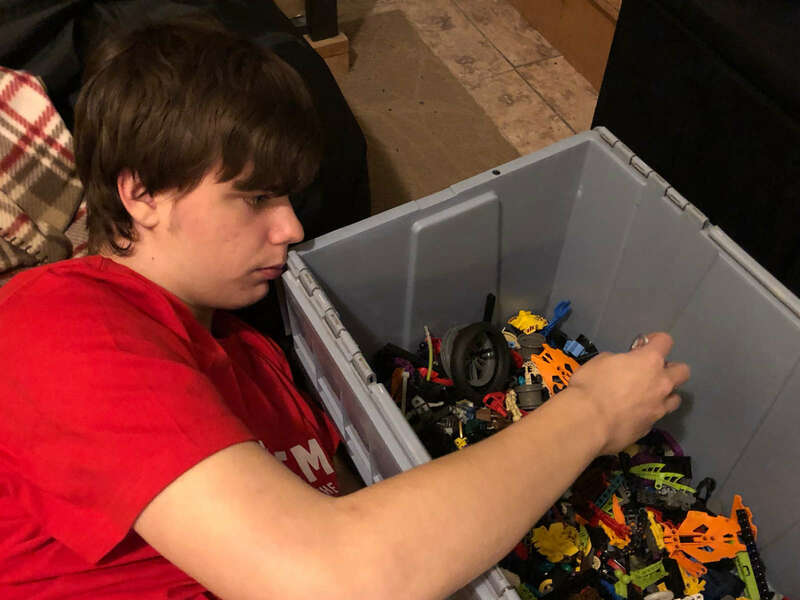 Danny sifts through Lego Technics parts to decide what he's interested in keeping. We're trying to get ourselves ready for smaller living quarters a few years down the road. 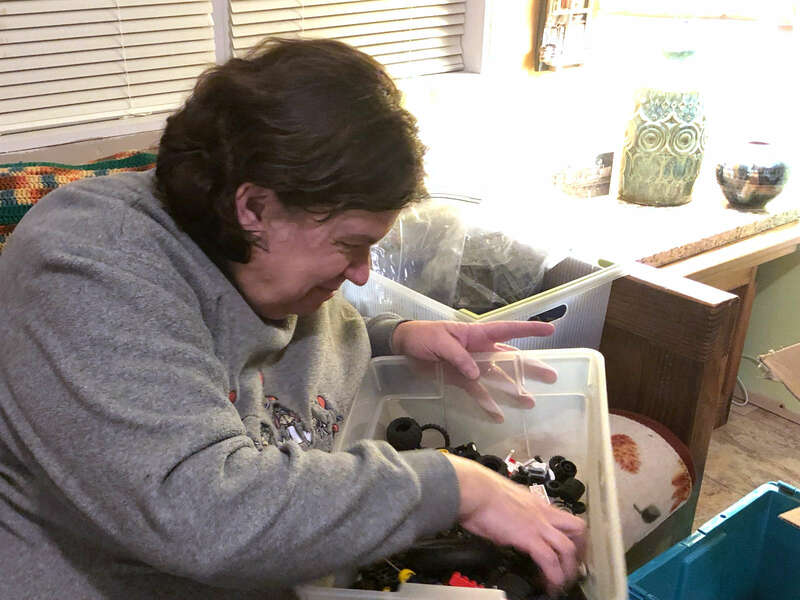 Karen sorts through Lego pieces. 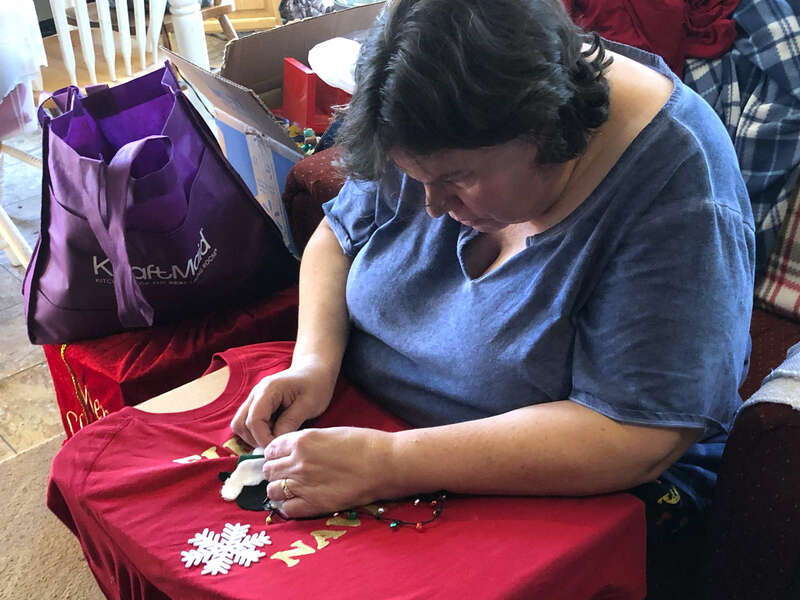 She's trying to put together Harry Potter kits and parts that will fit with the theme, which we use as part of Christmas, to go with the Hogwarts Express train. 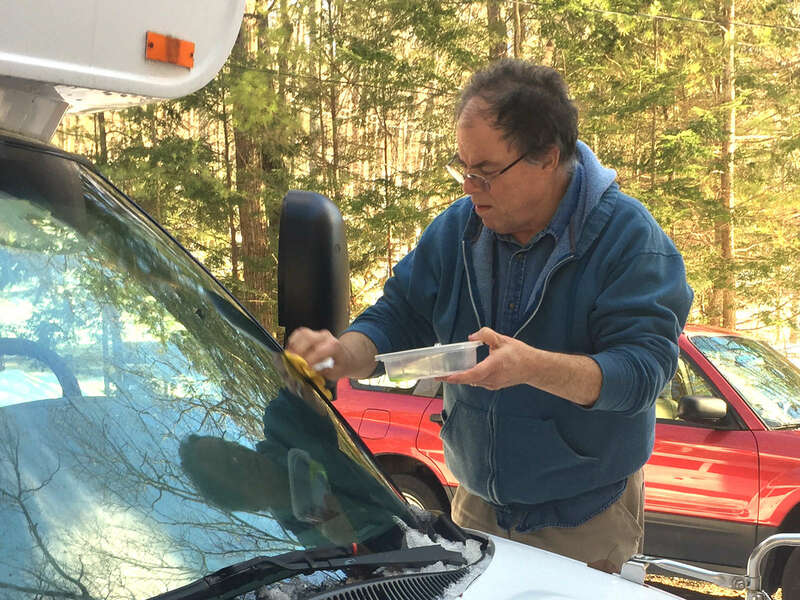 Gordon tries to wash away some hard-water stains from the bus windshield. Unfortunately, it didn't work. Back to the drawing board! 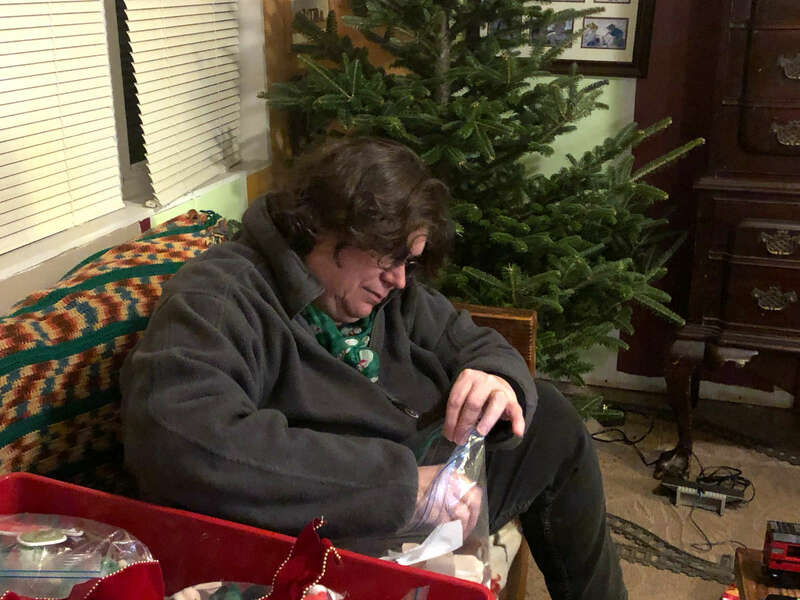 Karen puts away the Christmas decorations for the season. 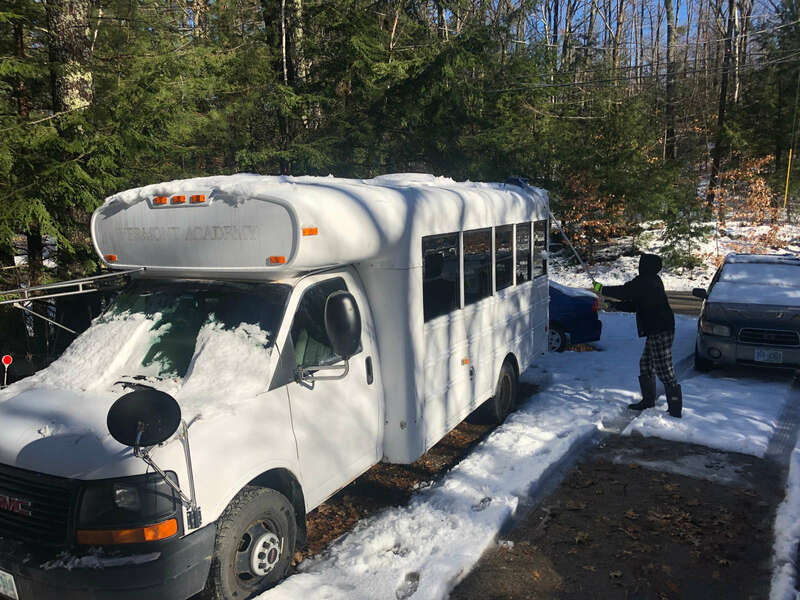 Danny scrapes some snow and ice off the roof of the bus. 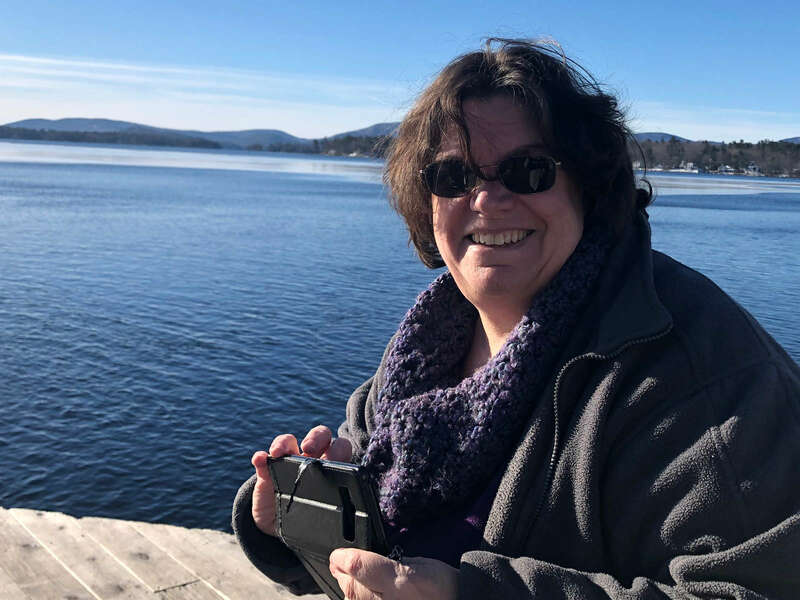 Karen snaps a few photos of Lake Winnipesaukee on a crisp day out with Gordon. 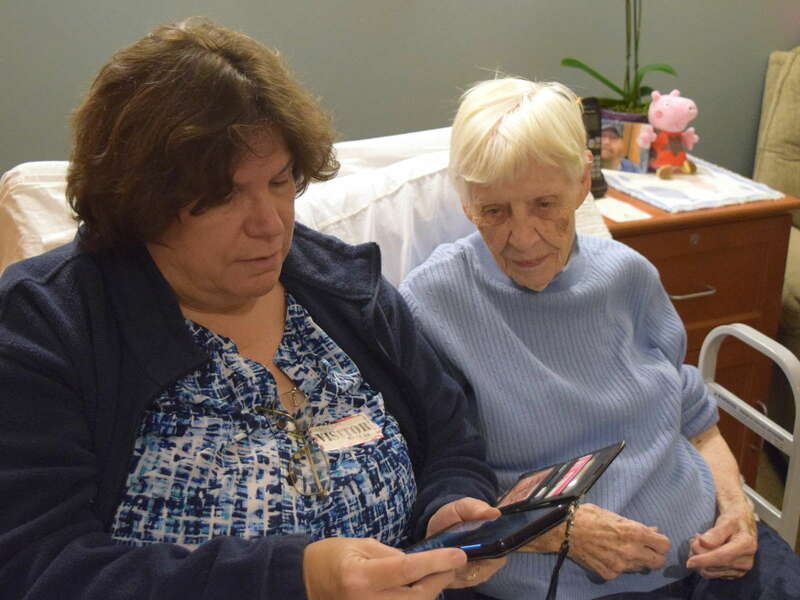 Karen plays a video racing game with Danny, something she hasn't done in a long time. 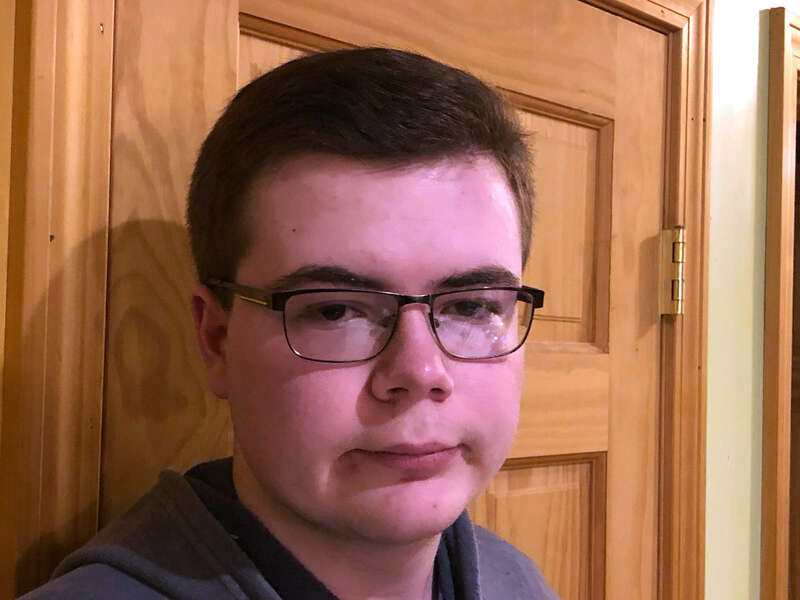 It was...interesting. 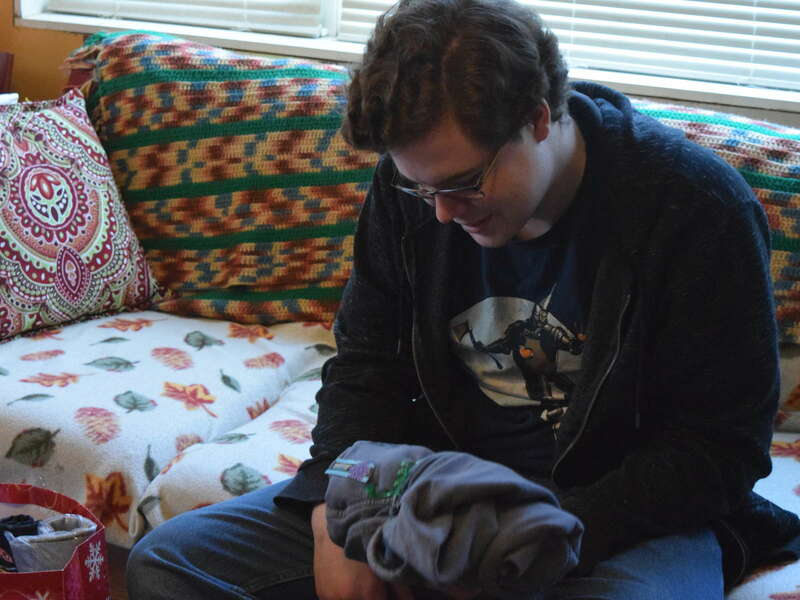 William gets a hoodie printed with the logo from the Marvel superhero Black Panther. Coincidentally, Karen and Danny were watching the movie on Christmas morning. 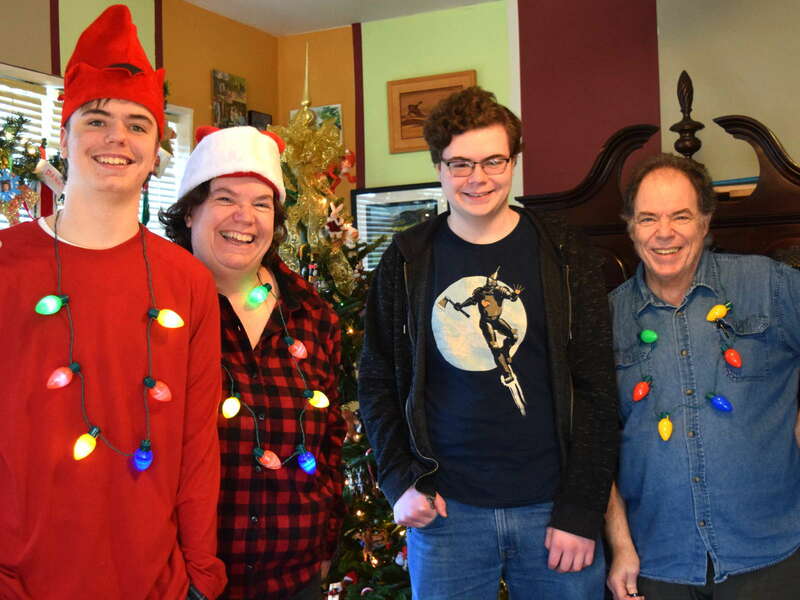 Danny, Karen, William, and Gordon in front of our Christmas tree for a low-key family day. 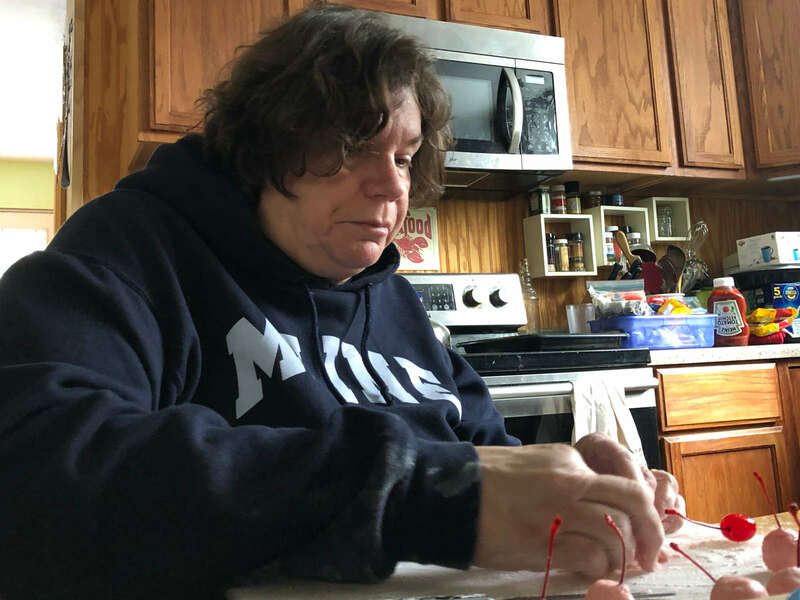 Karen working on the lights for her mother-in-law's ugly "seater" for Christmas. 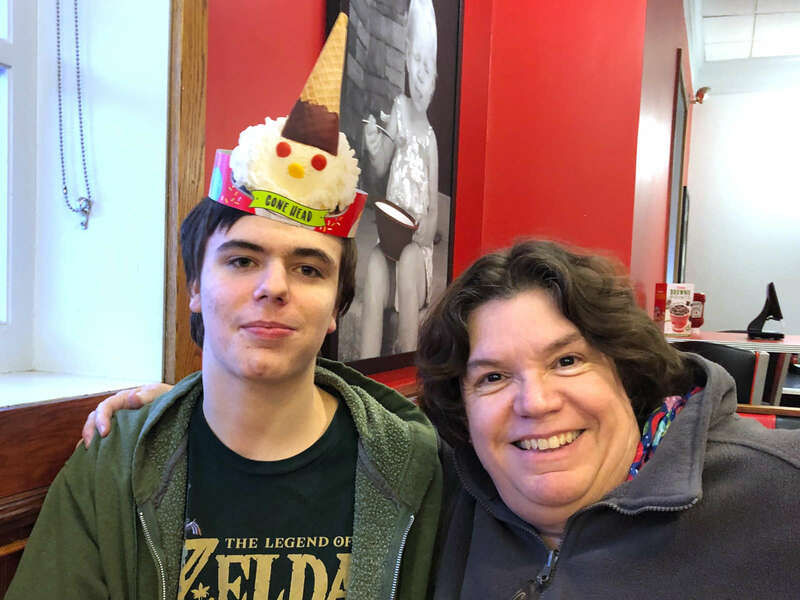 Danny and Karen at Danny's birthday dinner, which we had early because our schedule on his actual birthday is kind of a mess. 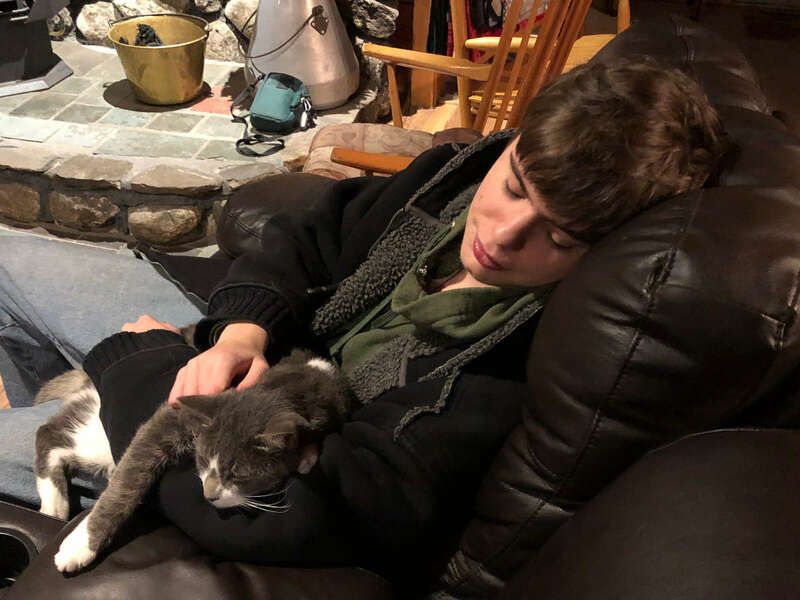 Danny finds a feline friend at our friend Larry's house, where we enjoyed a Thanksgiving buffet. 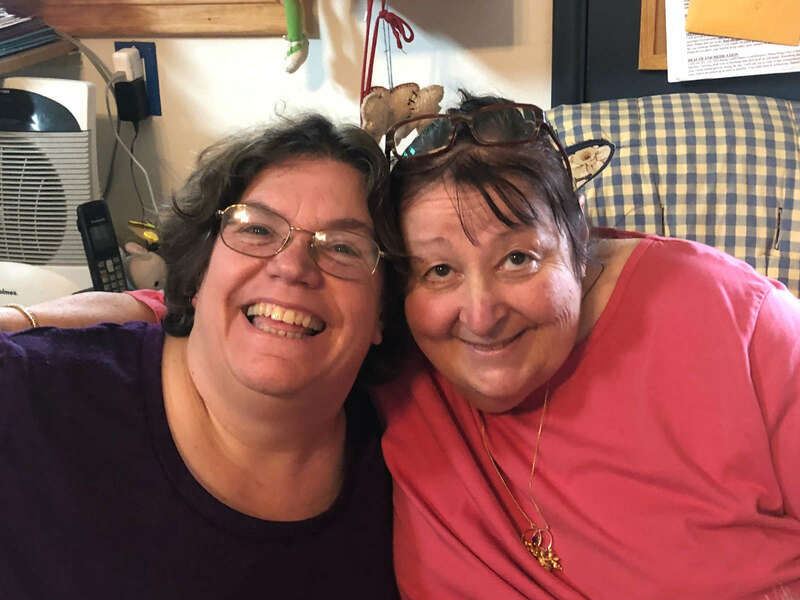 Karen visits with our long-time friend Mary Lou before we leave California. 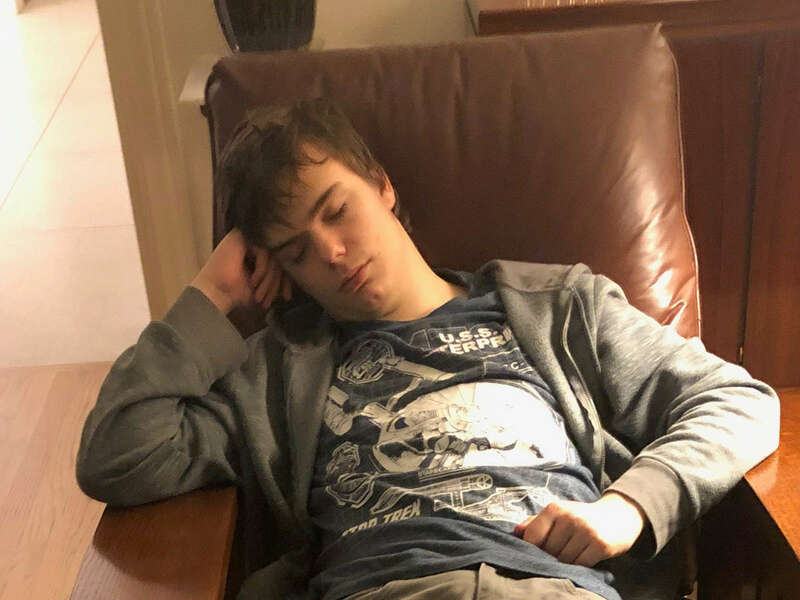 Danny dozes off after a very busy day and a pizza dinner at Chris and Ed's house. 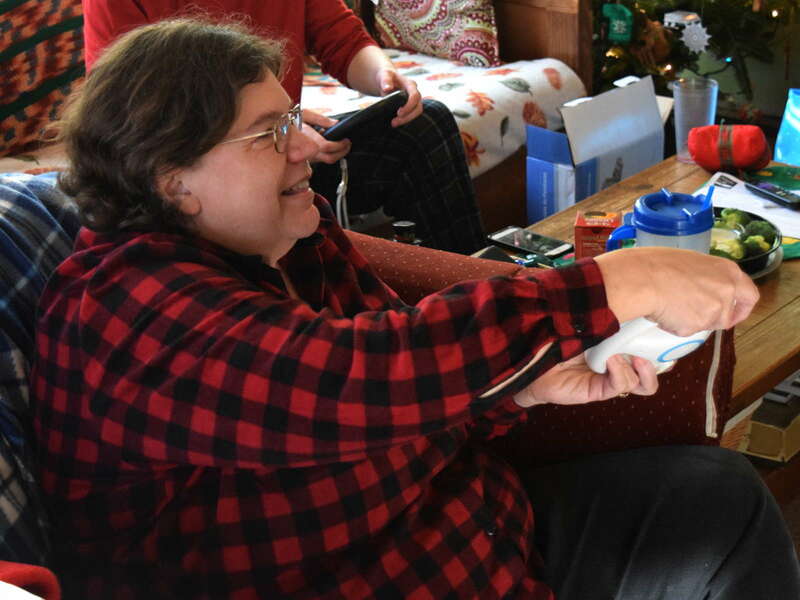 Karen shows Nana some pictures from her phone.